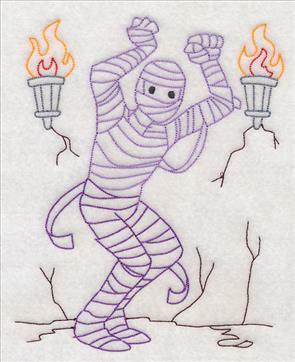 Pumpkins, ghosts, mummies -- oh my! 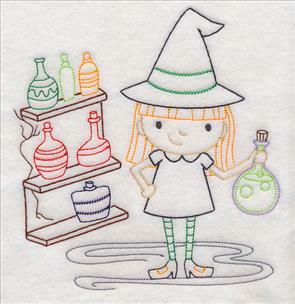 Celebrate the spookiest holiday of the year with 31 of your favorite one-color designs, plus 31 new vintage-style Halloween motifs, too! 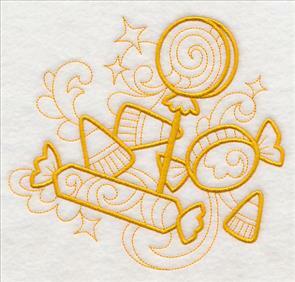 Each of these quick-stitching designs are stunning on any project for October 31st, including tea towels, tote bags, pillows, and more! 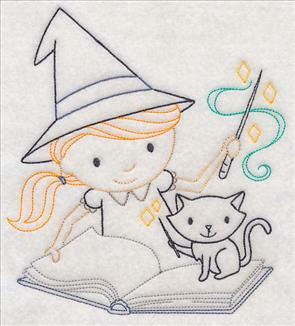 Add a grinning jack-o-lantern to a trick-or-treat tote, or welcome guests to your home with a garden flag bearing an adorable witch. 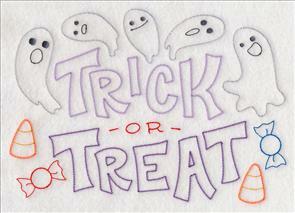 Decorate garden flags or trick-or-treat bags with de-frightful doodles that spell out Halloween's most iconic phrases. 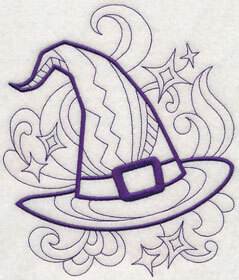 Perfect for any witch or wizard on October 31st! 6.62" x 5.85" and 5.50" x 4.85"
6.73" x 5.84" and 5.58" x 4.85"
3.85" x 3.34" and 2.98" x 2.58"
Light the way to your front door for trick-or-treaters with illuminating decor! 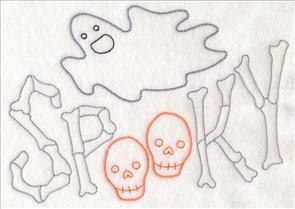 Embroider your favorite doodles (or other light-stitching designs) on organza, then add to a paper bag to make a luminary. 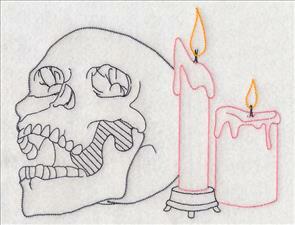 Battery-operated candles shine through the organza to cast an eerie glow. 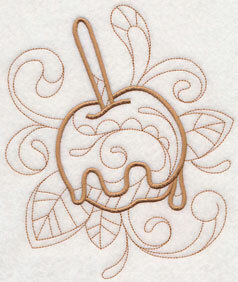 Watch how to make them in this new video, or follow the written project instructions here. 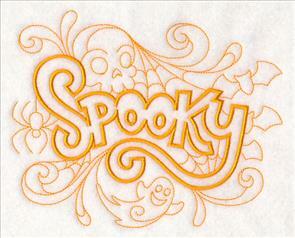 Stitch "Spooky" or "Boo" on a sweatshirt or tote bag to show your Halloween spirit wherever you go! 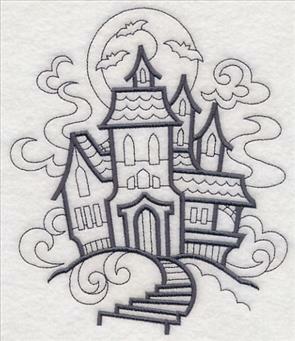 Ghosts, spiders, and other creepy creatures fill the background of these designs. 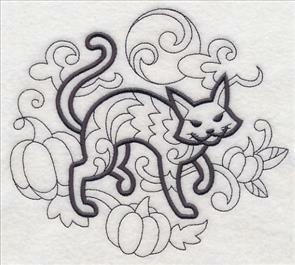 7.24" x 5.85" and 6.00" x 4.85"
6.58" x 5.85" and 5.47" x 4.86"
3.85" x 3.42" and 3.00" x 2.66"
What's Halloween with black cats and witches' hats? 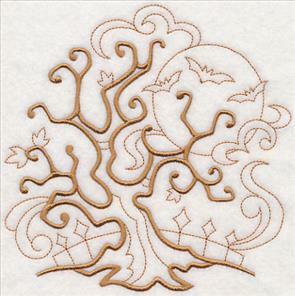 These quick-stitching designs feature a bold, satin-stitch motif in the foreground, with running-stitch detail in the background. 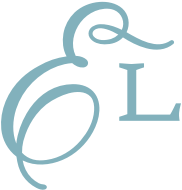 6.58" x 5.85" and 5.46" x 4.85"
5.85" x 6.83" and 4.85" x 5.66"
3.29" x 3.85" and 2.57" x 3.00"
Add a delightful look to tote bags, costumes, and more with this pair of grinning jack-o-lanterns. 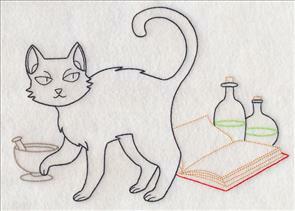 Each have their own distinct personality -- one shares a friendly smile, while the other casts a spooky look. 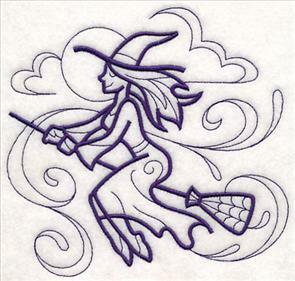 6.17" x 5.85" and 5.11" x 4.85"
3.84" x 3.43" and 2.98" x 2.67"
Celebrate the witching hour with a headstone that spells "RIP" or a witch flying on her broomstick. 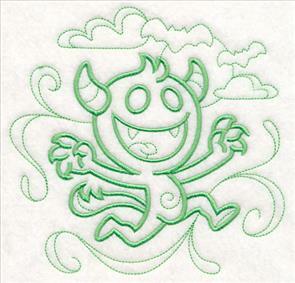 Pick your favorite colors to stitch these fun designs! 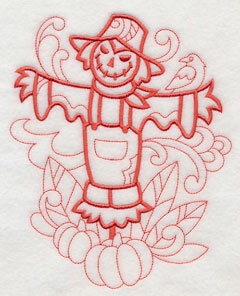 5.85" x 6.41" and 4.85" x 5.31"
6.10" x 5.85" and 5.05" x 4.85"
3.85" x 3.69" and 3.00" x 2.88"
Ghost, goblins, ghouls, and more can be found within this haunted house. 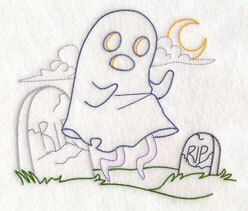 Stitch alongside a single ghost for a seriously spooky scene. 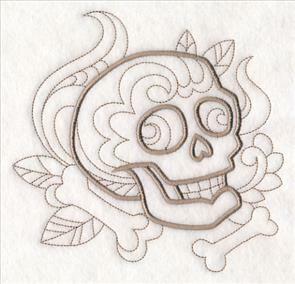 5.85" x 6.78" and 4.84" x 5.62"
5.85" x 6.78" and 4.85" x 5.62"
3.32" x 3.84" and 2.59" x 3.00"
Stitch a doodle skull on a pillow, or cast a spell on a wall hanging with a raven dressed as a witch. 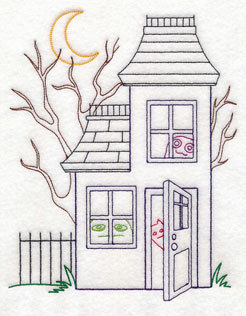 These one-color designs feature open spaces, meaning they're best stitched on solid, low-nap fabrics. 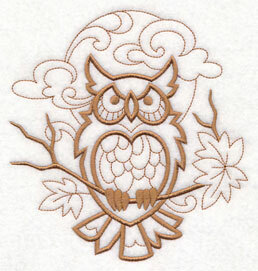 5.85" x 5.94" and 4.85" x 4.92"
Tea towels, canvas, denim, twill, and quilter's cotton are spectacular fabrics for these light and airy designs. 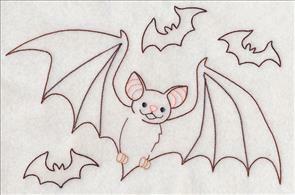 Here a bat and a pair of potions are ready to be stitched. 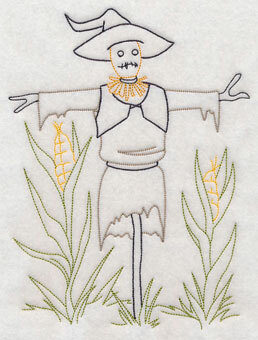 6.46" x 5.85" and 5.36" x 4.85"
5.85" x 6.12" and 4.86" x 5.08"
3.68" x 3.85" and 2.85" x 2.98"
All Hallow's Eve has never been this fang-tastic before! 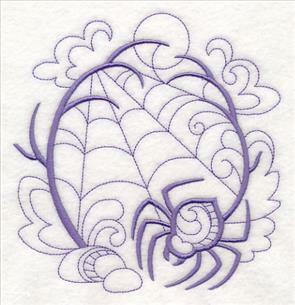 Add a bubbling cauldron to the tablecloth of your snacks station, or embroider this spider web on a pillow. 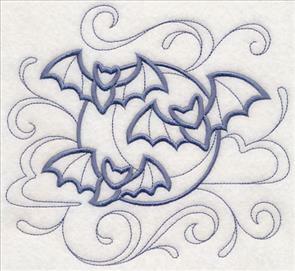 5.85" x 7.04" and 4.84" x 5.83"
5.86" x 6.03" and 4.85" x 5.00"
3.74" x 3.85" and 2.92" x 3.00"
Running-stitch bats circle the satin-stitch chandelier in the Halloween motif on the left. 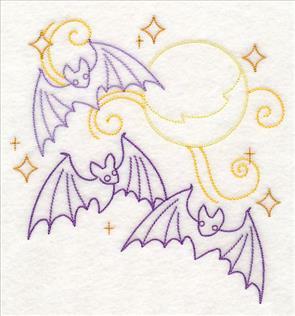 In the design on the right, they explore the night skies by the light of the moon. 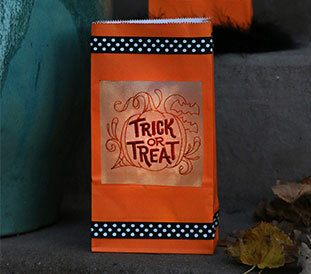 6.39" x 5.85" and 5.30" x 4.85"
3.85" x 3.52" and 3.00" x 2.74"
Forget going door-to-door for treats on Halloween night! 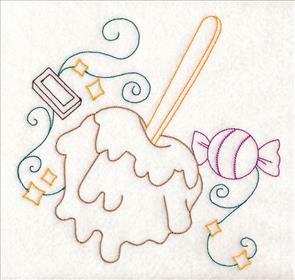 A caramel apple and pile of candy are available right here in these doodle designs. 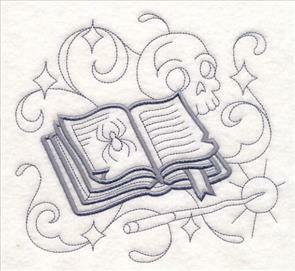 5.85" x 6.92" and 4.86" x 5.75"
3.86" x 3.53" and 3.01" x 2.75"
Cast a spell on friends and family when you embroider this spell book, complete with wand and skull. 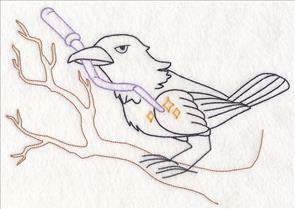 A spooky owl watches from his favorite branch in the moonlight. 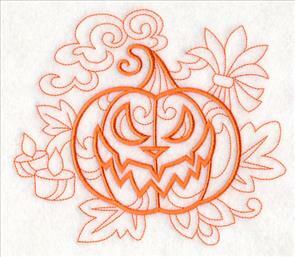 6.40" x 5.85" and 5.31" x 4.85"
3.71" x 3.86" and 2.89" x 3.01"
Decorate your yard with Halloween projects, including garden flags, outdoor pillows, and patio furniture. 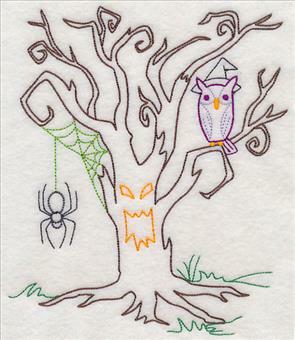 This spooky tree and "scare"-crow are the perfect choices for outdoor projects. 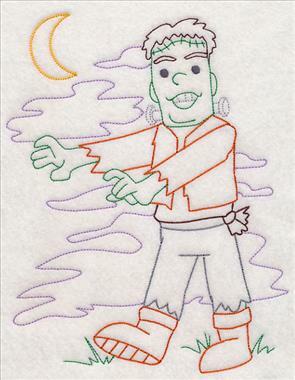 5.85" x 7.22" and 4.85" x 5.98"
3.12" x 3.86" and 2.43" x 3.01"
Embroider all things that go bump in the night -- including werewolves and mummies -- on your next project. 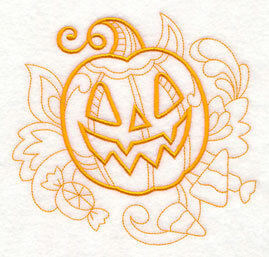 Quick-to-stitch and full of Halloween flair! 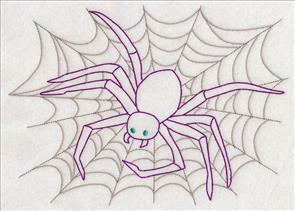 5.85" x 5.99" and 4.85" x 4.97"
3.75" x 3.85" and 2.92" x 2.99"
A too-cute-to-spook monster adds a hint of whimsy to Halloween. 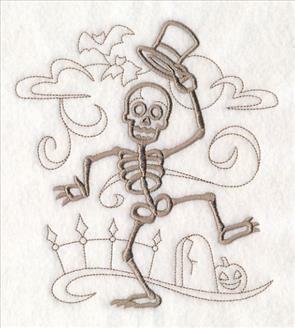 Or, stitch a dancing skeleton for a fun twist on your seasonal stitching. 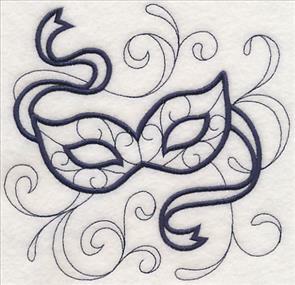 6.04" x 5.85" and 4.99" x 4.84"
5.85" x 6.42" and 4.85" x 5.33"
3.51" x 3.87" and 2.72" x 3.02"
A masquerade mask is a classic part of any costume! 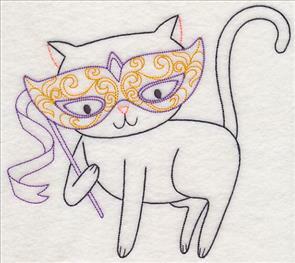 Here two versions are available -- a doodle mask, or a black cat wearing a mask. 6.03" x 5.85" and 5.00" x 4.85"
7.66" x 6.86" and 6.54" x 5.86"
5.42" x 4.86" and 3.86" x 3.46"
Vintage-style designs are light and quick-stitching, and feature open spaces where the fabric shows through. 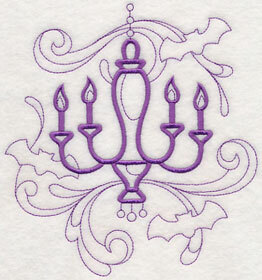 Choose smooth fabrics in solid colors for best results when stitching these designs. 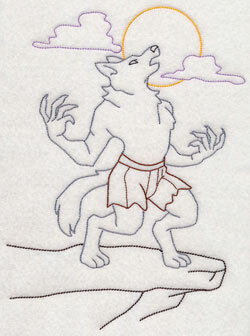 Excellent fabric choices include quilter's cotton, linen, twill, denim, canvas, and similar low-nap materials. 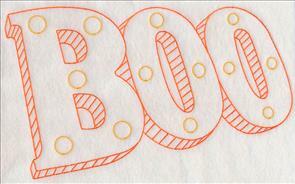 Share your love for October 31 with text designs saying "Boo" or "Happy Halloween"! 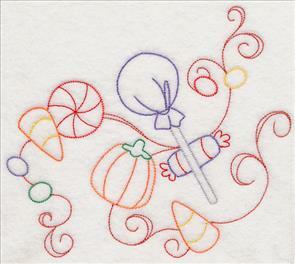 Great on trick-or-treat bags, a wall hanging, or a tea towel! 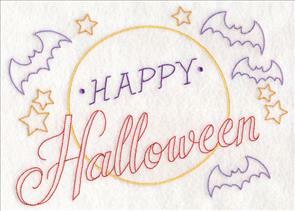 7.81" x 4.73" and 6.86" x 4.16"
9.63" x 6.85" and 7.81" x 5.55"
6.82" x 4.85" and 3.86" x 2.74"
These frightfully creative and colorful designs are terrific for adding to pillows, totes, or even apparel. 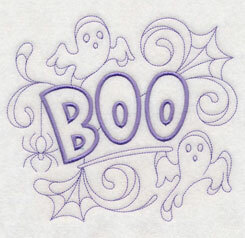 Add a haunting note to your next project with ghostly designs, like the "Trick-or-Treat" and "Spooky" motifs below. 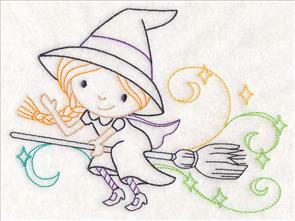 9.85" x 6.86" and 7.79" x 5.41"
9.92" x 6.90" and 8.48" x 5.90"
7.81" x 5.44" and 6.87" x 4.79"
De-frightfully adorable witches are fun and fabulous additions to any embroidery project! 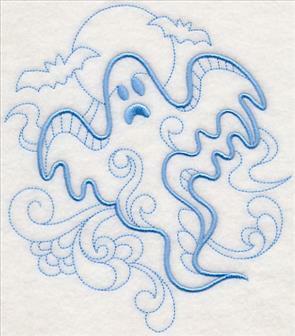 Great for kids' apparel, trick-or-treat bags, or quilts, too. 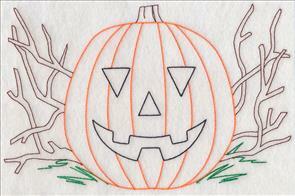 6.90" x 7.64" and 5.85" x 6.48"
6.90" x 7.26" and 5.87" x 6.17"
4.87" x 5.11" and 3.68" x 3.85"
A jack-o-lantern grins in this vintage-style design; a too-cute-to-spook witch saves from her broomstick. 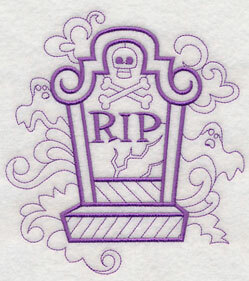 Great for adding a charming look to your Halloween decorating! 10.66" x 6.88" and 9.12" x 5.88"
7.80" x 5.04" and 6.85" x 4.43"
9.23" x 6.86" and 7.80" x 5.80"
6.53" x 4.86" and 3.85" x 2.86"
These spine-tingling designs are sure to add a spooky-scary look to any project. 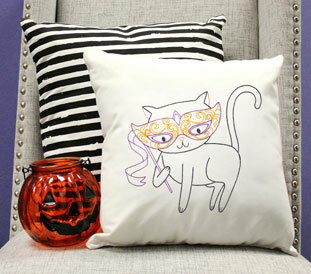 Great for pillows, welcome flags, and more. 7.68" x 7.81" and 6.86" x 6.98"
5.86" x 5.96" and 4.86" x 4.94"
9.42" x 6.85" and 7.80" x 5.67"
6.67" x 4.85" and 3.85" x 2.80"
Ghosts, goblins, and ghouls peek out from inside this haunted house. 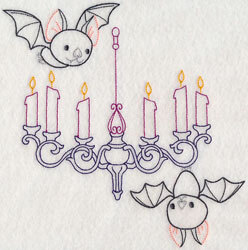 Stitch an eerie glow on framed art and aprons with these bats in the moonlight. 6.85" x 8.61" and 5.85" x 7.36"
6.90" x 7.22" and 5.87" x 6.14"
4.87" x 5.09" and 3.69" x 3.85"
Pull out your black pointy hat for Halloween! 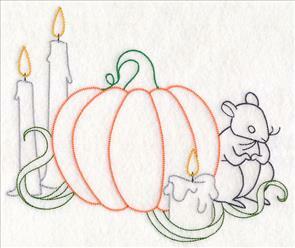 Classic spooky accents create the perfect bewitching scene, like a pumpkin and rat, or skull and candles. 8.52" x 6.90" and 7.23" x 5.85"
8.51" x 6.88" and 7.27" x 5.87"
6.04" x 4.88" and 3.88" x 3.13"
October 31 is when monsters of all types come out to play. 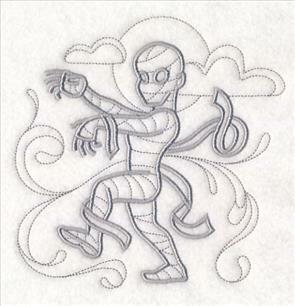 Here a mummy and Frankenstein's monster make their appearance. 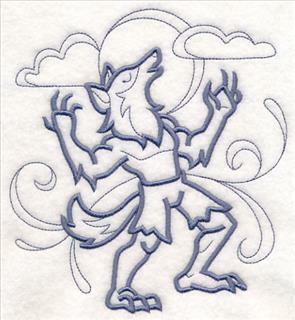 6.87" x 8.48" and 5.87" x 7.24"
6.90" x 9.15" and 5.85" x 7.76"
4.85" x 6.44" and 2.91" x 3.89"
Stitch this werewolf and skeleton on wall hangings and tote bags, or pair with the monsters above for an extra-spooky style. 6.85" x 10.01" and 5.85" x 8.55"
5.35" x 7.83" and 4.70" x 6.88"
6.75" x 7.80" and 5.85" x 6.76"
4.85" x 5.60" and 3.33" x 3.85"
"Trick or treat, smell my feet, give me something good to eat!" 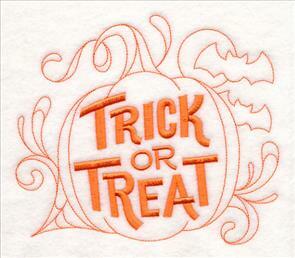 Enjoy the special treats Halloween has to offer in these bright and colorful designs. 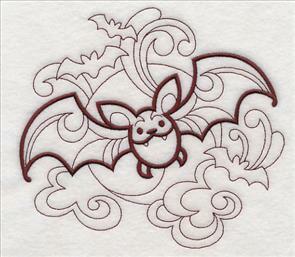 7.41" x 6.90" and 6.29" x 5.85"
7.79" x 7.61" and 7.01" x 6.85"
5.99" x 5.86" and 4.97" x 4.86"
Bats fly across the night sky in preparation for midnight on All Hallows Eve. 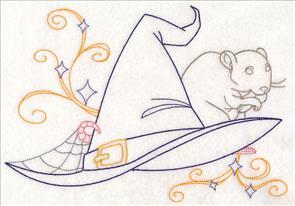 A pointy witch's hat sits alongside a rat in this scene. 10.33" x 6.91" and 8.75" x 5.86"
9.97" x 6.86" and 8.52" x 5.85"
7.82" x 5.37" and 6.87" x 4.72"
Whooooo's ready for October 31? 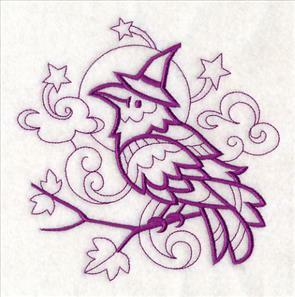 This spooky owl keeps watch by the moonlight; a black crow carries a magic wand. 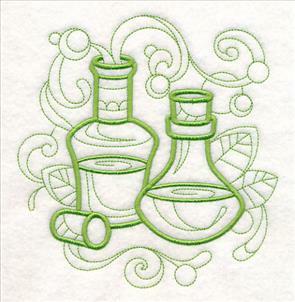 Great for pillows, tea towels, or a quilt! 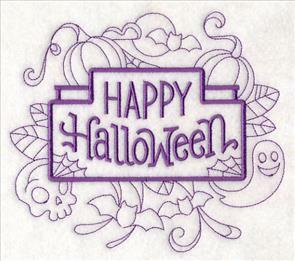 6.91" x 7.18" and 5.86" x 6.09"
9.94" x 6.86" and 8.49" x 5.86"
7.81" x 5.39" and 6.85" x 4.73"
Give your Halloween party a spooky-scary atmosphere with these vintage-style embroidery designs. 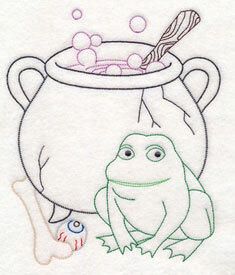 A tombstone and zombie hand are shown on the left; a bubbling cauldron, frog, and eye ball are on the right. 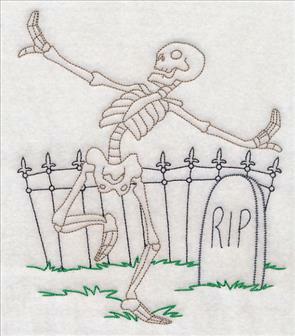 9.37" x 6.89" and 7.81" x 5.74"
6.53" x 7.77" and 5.86" x 6.98"
4.86" x 5.79" and 3.25" x 3.87"
Give your yard a scary look this Halloween with a spooky tree or vintage-style "scare"-crow. 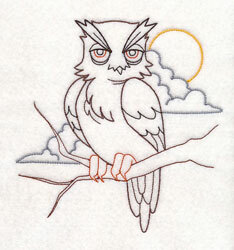 Great on flags, outdoor pillows, wall hangings, and more! 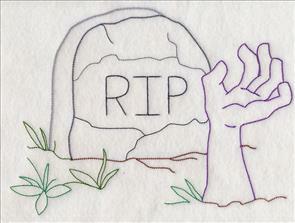 6.62" x 7.80" and 5.85" x 6.90"
6.84" x 9.03" and 5.85" x 7.71"
4.85" x 6.39" and 2.92" x 3.85"
A ghost floats through the graveyard while a black card guards a spell book. 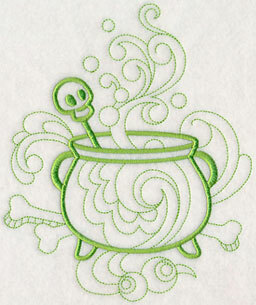 Fun and frightful additions to tote bags, pillows, towels, apparel, and more! 7.78" x 6.61" and 6.91" x 5.86"
9.68" x 6.86" and 7.80" x 5.54"
6.85" x 4.86" and 3.85" x 2.73"